Los Angeles police have conducted a sweeping raid aimed at the Avenidas street gang in Los Angeles, The raid even netted a corrections officer who was acting as a messenger to imprisoned gang members. The Associated Press reports as follows. "LOS ANGELES (AP) -- More than a thousand law enforcement officers descended Tuesday on the homes of key members of a notorious street gang suspected of killing a sheriff's deputy and murdering rivals while defying authorities for decades. A federal indictment named 88 suspects and detailed criminal activity spanning more than a decade. Forty-six people were arrested in the pre-dawn raid targeting members of the Avenues gang, which claims a swath of northeast Los Angeles as its turf. Among them was Tammy Armstrong, a corrections officer accused of helping incarcerated gang members, Deputy Police Chief Charlie Beck said. It was unclear when she might be arraigned." Many city residents fear the day when gang members return to the street. California's budget woes, in which prisoners have been released early has been cited as grounds for well founded fears that respite from gang violence might only be temporary. An additional fear is of other street gangs filling the power vacuum created by the weakening on a major player on the LA gang scene. Gangs in Los Angeles and elsewhere have connections that stretch across state and even national boundaries. 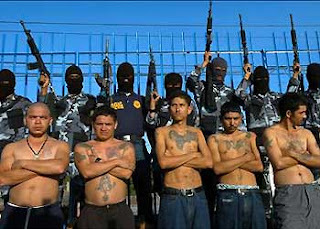 It is reported that the Mexican mafia has been involved in brokering peace deals between rival gangs. The Prison Planet web site even discusses an agenda of "ethnic cleansing" of African Americans that is a part of the Mexican street gang agenda.Prison Planet reports as follows. "Racist Mexican gangs are indiscriminately targeting blacks who aren't even involved in gang culture, as part of an orchestrated ethnic cleansing program that is forcing black people to flee Los Angeles. The culprit of the carnage is the radical Neo-Nazi liberation theology known as La Raza, which calls for the extermination of all races in America besides Latinos, and is being bankrolled by some of the biggest Globalists in the U.S."
The article cites instances of racially motivated violence such as the following. "In one typical case," writes journalist Brentin Mock, "Three members of the Pomona 12 attacked an African-American teenager, Kareem Williams, in his front yard in 2002. When his uncle, Roy Williams, ran to help his nephew, gang member Richard Diaz told him, "Niggers have no business living in Pomona because this is 12th Street territory." According to witnesses, Diaz then told the other gang members, "Pull out the gun! Shoot the niggers! Shoot the niggers." All of this raises the question of federal assistance to wars on gangs. It would seem that RICO statutes are applicable to gang activities. In light of the overt racism involved, perhaps civil rights statutes could be invoked as well. Since so many gangs are national and in some cases, international, it would seem that there is a pressing need for Federal involvement. Many people join gangs in prison for their own protection. It is all too frequent that prison administrators step back and let the gangs run the prisons on a day to day basis. This "privatisation" of safety has been a failure. Restructuring prisons into austere oases of safety, rehabilitation and restitution should be a high priority. The authority of gangs should stop at the prison gates. Unfortunately, this is today a distant dream. There are many instances where the federal government is overly involved. The growing problem of gangs is not one of them. Street gangs are big business. They are a national problem close to and in some cases related to terrorism. Defeating them means a nationally coordinated strategy. Street violence chases away legitimate business that could provide opportunities that are an alternative to the violence of the street. The City of Los Angeles is to be commended for facing up to its gang problem. If New York City and other major municipalities would step up to the plate in admitting their own difficulties with gangs, it might be the start of some real solutions.